Aptito brings to life the menu of your restaurant or bar like never before with vivid, eye-catching images of each item, helping to increase your average ticket size by an impressive 15%-20%! Regular, text-type menus simply do not draw the attention like digital ones do. Aptito’s comprehensive catalogue of menu items and mouthwatering pictures introduce guests to delicious foods that would’ve otherwise gone unnoticed. Aptito provides an unparalleled dining experience. With our iPad menus, customers are able to place orders, request a server’s attention, view nutritional info, send special instructions to the chef (i.e. “I’d like my steak medium-rare please.”) and pay electronically without the hassle of trying to flag down a server. Our digital menus can be customized to give them the look and feel you desire. You can upload your restaurant’s logo so it appears on the menu’s heading and choose from numerous design templates to add your own personal touch. You can easily make changes “on-the-fly” and avoid wasting time and money to reprint menus each time you change an item or price. You can also feature customer favorites more prominently, helping the newcomer to order and be more satisfied with their initial dining experience. As they say “You only get one chance to make a first impression”. Aptito’s iPad restaurant menus will enhance your understanding of the customer’s preferences and opinions. Our post-meal rating and review system provides instant feedback to help you improve the dining experience. Now you can be a step ahead, adapt, and provide for your customers wants before you risk losing them for good. See how many people recommend your restaurant to their Facebook friends directly from your menus. Restaurant owners can offer their customers discounts, send coupons, promote special events, and send monthly newsletters for updates on any new developments. Place the digital menu displays out front to show off your current menu and attract passing foot traffic. A big favorite to the health conscious customer is our “Nutritional Facts” section. This provides guests with the breakdown of ingredients for each menu item, helping calorie counters and people with food allergies alike. And let’s not forget about side orders – digital menus work to up-sell side orders by allowing them to be featured alongside main entrees. This is ideal for a la carte type restaurants especially. Start using Aptito POS today! 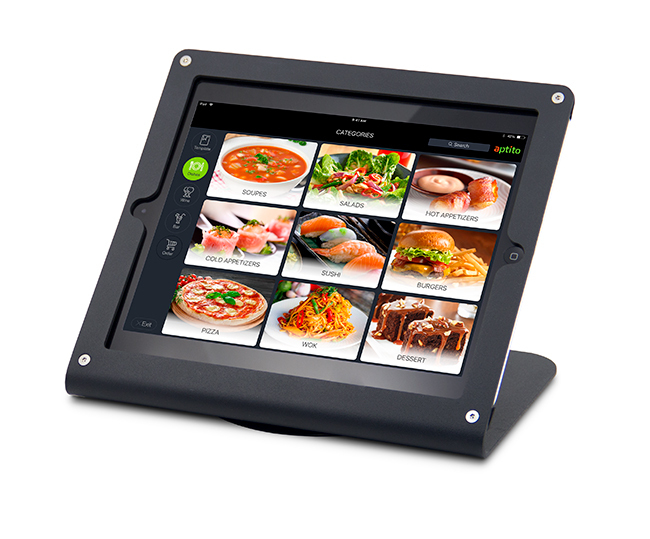 Do you know of any restaurants that could benefit from Aptito’s all in one POS solution? Earn from 20% of our net revenue, generated by the referred merchant, perpetually, paid to your bank account monthly. Referrals are tracked and paid when sale is complete.